The Houston Area ACFE offers a variety of opportunities to area students, universities, and educators. For additional information on any of these programs, please contact the Houston Area ACFE Student Relations Director. Student resumes are reviewed by industry professionals who provide feedback on enhancements. Deadline for submission are September 15 (Fall Semester) and February 1 (Spring Semester). Resumes should include email address and phone number, but not physical address. Additionally, we encourage you to include your GPA. Please submit to Houston Area ACFE Student Relations Director. Student resumes are sent out to the Houston Area ACFE membership so that members may have the opportunity to reach out to students to fill openings for internships, part-time or full-time positions. Deadline for submission are October 15 (Fall Semester) and April 1 (Spring Semester). Please submit to Houston Area ACFE Student Relations Director. The Houston Area ACFE has established scholarships directly through Sam Houston State University, University of Houston, and University of Houston - Clear Lake. 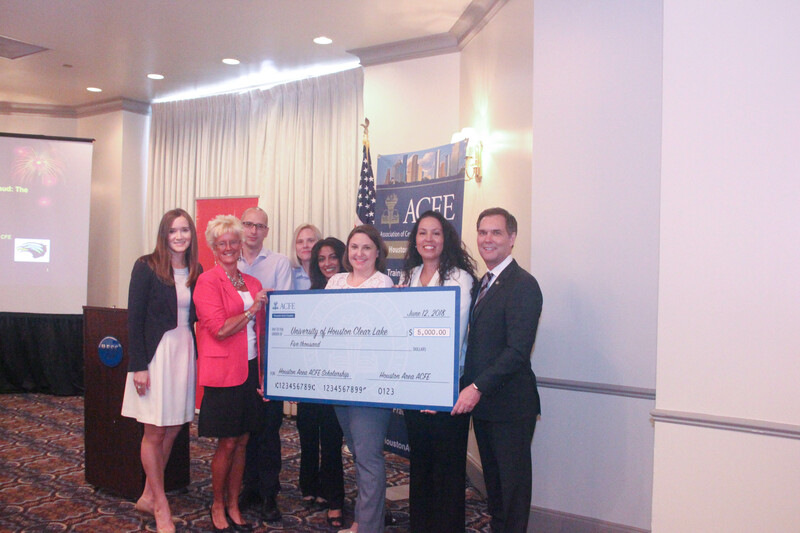 The ACFE awards the Ritchie Jennings Scholarship during Spring Semester each year. Deadline for submission is January 30, 2019. For more information visit the ACFE website. Student members of the Houston Area ACFE are eligible for discounted event entry. Please note that members of a university student chapter and/or the ACFE are eligible with proof of membership. The Houston Area ACFE offers a limited number of student passes to several luncheons throughout the year. Please contact the Houston Area ACFE Student Relations Director for more information. The ACFE offers opportunities for students to enroll as a mentee to participate in the ACFE Mentoring Program following established program guidelines. Mentees can enroll through the ACFE website. for events, support during the officer election process and speakers for events. For more information on how to create a student chapter, please visit the ACFE website. The Houston Area ACFE offers speakers for student organizations, events and classes upon request. We ask that you provide a least 4 weeks notice so as to allow ample time for our volunteer speakers to plan to attend your event. 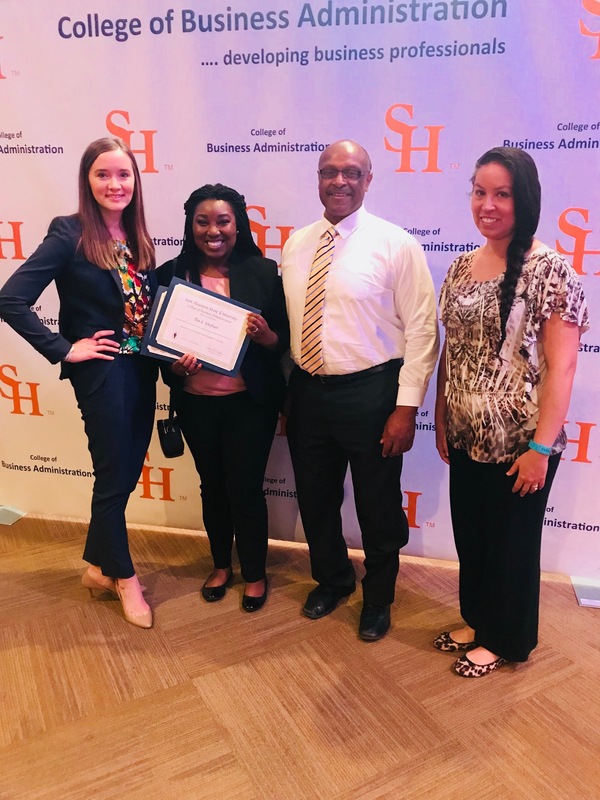 Fall 2015: (1) Speakers attended student chapter events at UHCL and SHSU to provide an overview of the ACFE and CFE designation; and (2) Houston ACFE and SHSU hosted a joint event at the SHSU Woodlands campus with Professor Andy Bennett as speaker. 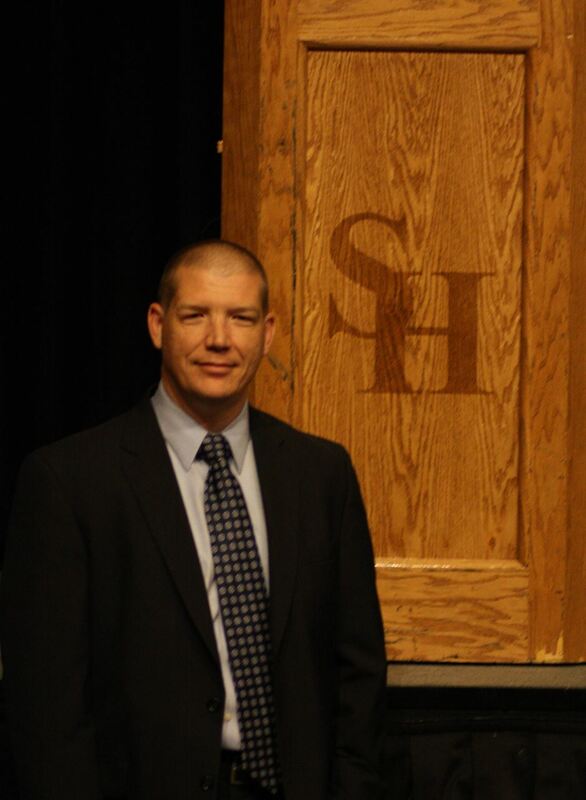 Spring 2016: (1) Robert Ward, Charles Dixon and Al Mitchell attended student chapter events at SHSU to speak on the topics including Preventing Diversions to Forbidden Nations, case studies, and career advice; and (2) Scott Lanham was the Keynote Speaker at the Future Tech Conference at SHSU. Summer 2016: 1 student connected and successfully employed with area employer via Houston Area ACFE Student Relations. 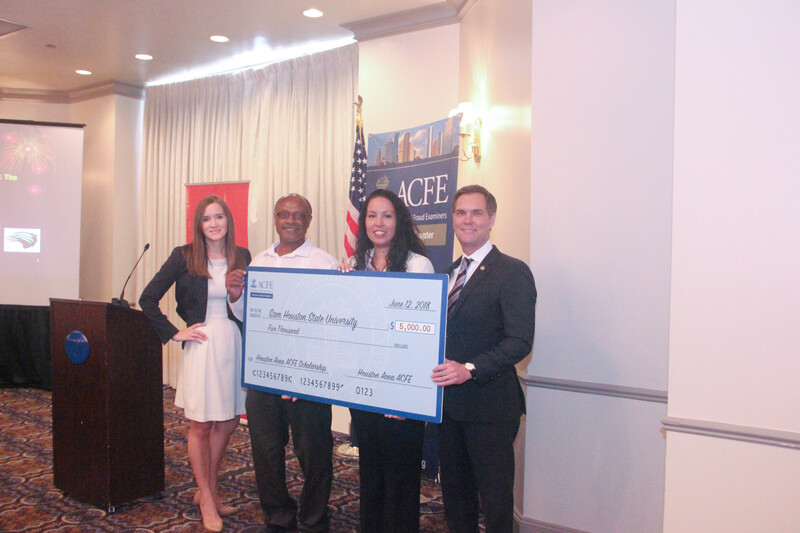 Fall 2016: (1) Scott Lanham and Al Mitchell spoke to Accounting classes at SHSU in October; (2) Gabriella Marshall spoke to Accounting class at American InterContinental University in October; (3) Gabriella Marshall spoke to ACFE student chapter meeting at UHCL in October; (4) the Houston ACFE scholarship was awarded to Y (Anna) Nguyen of UHCL; and (5) 1 student connected and successfully employed with area employer via Houston Area ACFE Student Relations resume blast. Spring 2017: (1) Katherine Avery Guillot spoke to SHSU student chapter in February; (2) Scott Lanham and Al Mitchell spoke to Accounting classes at SHSU (Huntsville and The Woodlands) and the SHSU student chapter in April; and (3) Y (Anna) Nguyen of UHCL was awarded a Ritchie Jennings scholarship. Fall 2017: (1) Chrysti Ziegler spoke at SHSU on Sept 20th; (2) Patrick Rodriguez spoke to SHSU on October 18th; (3) Scott Lanham spoke to SHSU on Nov 1st; and (4) Al Mitchell spoke to SHSU on Nov 15th. Spring 2018: (1) Houston ACFE sponsored viewing of All the Queens Horses at SHSU Huntsville and Woodlands campuses offering free CPE to attendees; (2) Chrysti Zielger spoke at SHSU on February 7th; (3) David Kirtland spoke to SHSU on February 28th; (4) Scott Lanham to speak to SHSU on April 4th; (5) on April 11th, SHSU hosts Ethics of Enron and free CPE is issued by the Houston Area ACFE; (6) Gabriella Marshall spoke at UHCL on April 13th; (7) Katherine Avery Guillot and Chrysti Ziegler presented the Houston Area ACFE Scholarship at SHSU; (8) Shawn Pickens to speak to UH on April 16th; (9) Al Mitchell to speak to SHSU on April 18th; and (10) Krystin Mitchell to attend UHCL Student Leadership Banquet. Fall 2018: (1) Houston Area ACFE promoted event on the topic of Identifying Fraudulent Documents with Dr. Tim Louwers at SHSU Woodlands Campus on August 23rd ; (2) Mehboob Shrivastava spoke to SHSU ACFE Student Chapter on September 19th; (3) Houston ACFE hosted joint event with UHCL in with Michelle A, Blaine, J.D. spoke on the topic of FCPA & Global Corporate Corruption Risk; (4) 15 students from UHCL and UH participated in the Houston Area ACFE resume review; (5) Doug Manhart spoke to SHSU ACFE Student Chapter on October 3rd; (6) Patrick Rodriguez participated in UH ACFE Student Chapter Event Grill the Auditors Speaker Panel; (7) 14 students from UHCL and UH participated in the Houston Area ACFE resume blast; (8) 8 student volunteers from SHSU, UHCL and UH supported n the Houston ACFE Fraud Conference on October 18th and 19th; (9) Gabriella Marshall and Chrysti Ziegler participated in UH ACFE Student Chapter Cross Functional Panel on October 24th; (10) Katherine McMillen spoke to SHSU ACFE Student Chapter on October 31st; (11) Thomas Mullinnix spoke to SHSU ACFE Student Chapter on November 7th; (12) Cheryl Carter, JD spoke to SHSU ACFE Student Chapter on November 14th; and (13) the Houston Area ACFE Scholarship at UHCL was awarded to Diyoni Apriliana. 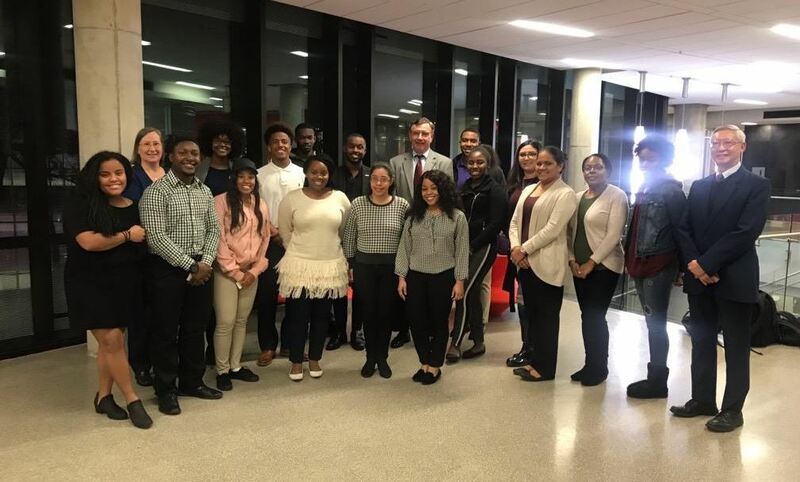 Spring 2019: (1) Mehboob Shrivastava spoke to SHSU ACFE Student Chapter on February 6th on the topic of cyber security, (2) Allen Mitchell spoke to SHSU ACFE Student Chapter on March 6th on the topic of Role of Criminal Justice in Fraud Investigations, (3) Allen Mitchell spoke to students at Prairie View A&M in March, (4) Thomas Mullinnix spoke to the SHSU ACFE Student Chapter on April 3rd on the topic of Addressing Social and Cultural Challenges When Traveling Abroad, and (5) David Kirtland spoke to the UHCL ACFE/ISACA Student Chapter in April. 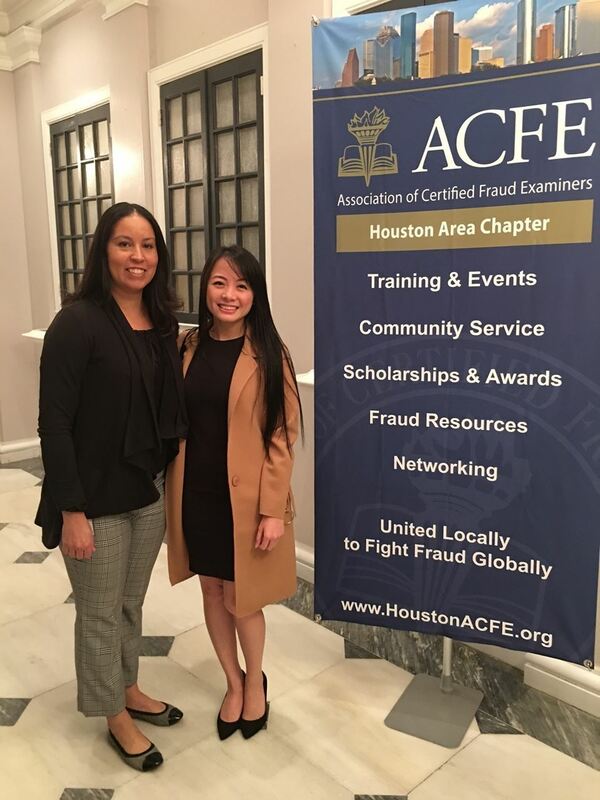 Fall 2016 Scholarship Winner Anna Nguyen with Houston ACFE President, Chrysti Ziegler. 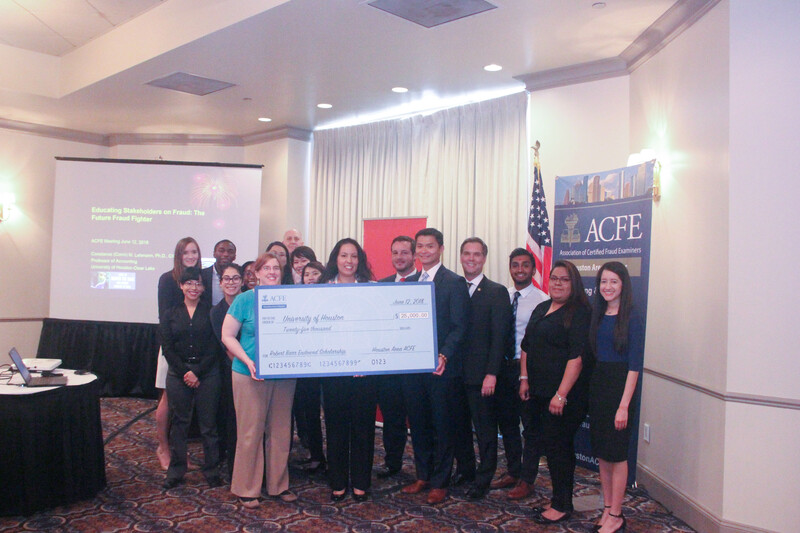 In June 2018, the Houston Area ACFE announced the creation of multi-year scholarships at Sam Houston State University and University of Houston-Clear Lake, as well as the endowed Houston Area ACFE Robert Barr Scholarship at the University of Houston. 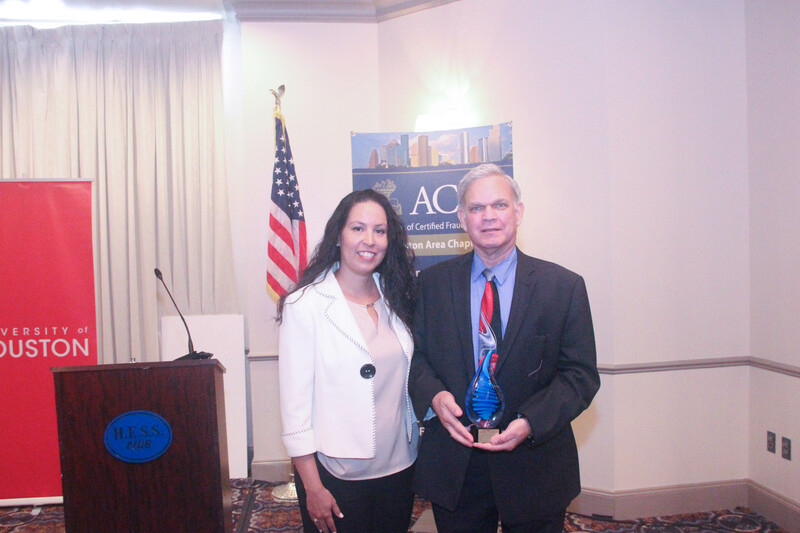 The Houston Area ACFE also honored Bob Barr for his many years of service to the anti-fraud education. Allen Mitchell speaking to Prairie View A&M students in Spring 2019.